This is a teacher’s book written by teachers for students and of course, for other teacher. A teacher’s book is different from a critic’s book. A critic’s book uses a style for comfortable, pleasurable reading even while making profound observations on a film. It is addressed to a wide readership across the book reading community, national and international. A sholars’s book is research based and is meant primarily for other research workers the world over, as also for teachers who could selectively use the material in the book for appropriate use with students. Most often students find a scholar’s book high above them, and appropriately so. Prof. Satish Bahadur taught at the Film & TV Institute of Indian in its early phases from 1963 to 1983 as professor of Film Appreciation. IN the foundational years he established the use of international film classics as an essential learning input for students learning different aspects of film making. He was officer in charge of the National Film Archive of India when it was established and continued to be associated with its academic work. He was consultant to UNESCO on several programmes relating to Film Education. From Education. From 1967, he established the one month long extension Course in Film Appreciation for Participants from all over country. Appreciation for participants from all over the country. The course of the 2009 summer at Pune was 35th in this series. Professor Bahadur also taught umerous extension course of average 10 day duration in places all over the country, literally from Rajkot to Imphal and Chandigarh to Trivandrum for local Kosts like a film society or an educational institution. He has been honoured with the first Satyajit Ray Award for promotion of film culture in India. Dr. Shyamala Vanarase, psychologist, HRD consultant and art critic has lately been active in the newly emerging culture of course in the Marathi language. Earlier she had taught Psychology and Communication in several institutions in Pune. She has worked on numerous Film Appreciation extension programmes with Prof. Bahadur Dr. Vanarse has written ten book son her professional interest. Of special interest is her analysis of the stage presentation of Vijay Tendulkar’s play “Ghashiram Kotwal”. Her book in Marathi on the psycho-social aspects of themes in the film of Satyajit Ray has been published. This is a study of the three films of Satyajit Ray: Pather Panchali (Song of the Road, 1955), Aparajito (The Unvanquished, 1956) and Apur Sansar (The World of Apu, 1959) which are popularly known as The Apu Trilogy. We focus on the design of the narrative presented by the film maker on the screen. In this sense it is a study of the text of films, the warp and woof of the elements which hold the films together. All other aspects of the films are outside the frame of our study, not because they are not important, but simply because they are outside our frame. Thus, we do not refer to the bio- graphical details of Satyajit Ray and the vast range of his other films, or to the production details of the Trilogy, or to problems of adaptation from the novel, and numerous such aspects. We have firmly confined ourselves to the study of text of the films. Now I describe the method for the actual teaching of analysis of the classics for students learning film making. I am numbering the different stages in the progression of teaching to keep my statement clear. (1) At the first stage some specially written progamme notes on the film are given, one copy for each student. These notes contain brief introduction to the production credits of the film, as also the social history of the background to the plot. Any cultural complications of the characters are also briefly explained. The main body of these notes contains the macrostructure of the film, which, in effect, is the progression of the film in terms of large segments of the plot. 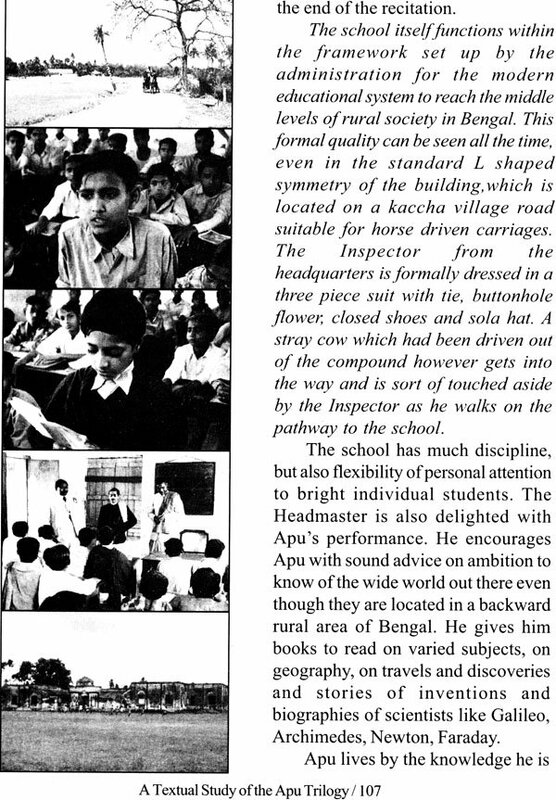 If the script of the film exists as a book in print, the students are encouraged to read it independently. (2) The second stage is the first projection of the film. It is done with a brief introduction by me, mainly drawing attention to the programme notes circulated earlier. The film is projected continuously. It is followed by a very brief period in which some first reactions are noted. Students are asked to read the macrostructure carefully. Now that they have seen the film, it should make more sense. (3) The third stage. The next day, the film is projected again with some lights on at the back of the hall, which enables students to maintain a mental distance from the screen and see the visual image as a cinematographic image and to hear the sounds as audio images. During the projection I am with a portable mike, my voice audible above the slightly lowered sound volume of the film. The film is run sequence to sequence, and while it is running I make observations on the visual composition of shots, the design of sound and significant editing devices. The purpose is to draw attention to the microstructural details of the film. At the end of a sequence, the projection would be halted, the hall lights switched on, and I would work on the blackboard handling questions and giving further explanations. If I felt that the micro details of audio-visual compositions had not quite got across to students in one screening, I would project the sequence again, and give more pointed attention to whatever needed further emphasis. A run of the visuals of a scene without sound would enable the visuals to be seen with pointed attention, also draw attention to the sounds which are missing. Likewise, a run of the sound track with the visuals switched off would draw pointed attention to the multiplicity of sound elements and how they get related to the missing visuals. I am talking of the days of 16 mm or 35 mm film when we needed careful coordination with the film projectionist. Now with the film on DVD, the teacher himself can control the projection. During such analytical exercises the students have to be reminded all the time that we are not watching the film: we are studying it. In any group there would always be some students who would protest against killing the film, as if we are plucking the wings off a beautiful butterfly. Analysis is not killing, it is activating the mind to discover what makes the film a living thing. It is the carefully selected and arranged audiovisual details which lend depth to the film composition and make it a rich experience. The material for this book has emerged from actual teaching situations. Hence the writing style occasionally uses a free flowing conversational method with a classroom flavour. This is a teacher's book written by teachers for students and of course, for other teachers. A teacher's book is different from a critic's book and also a scholar's book. A critic's book uses a style for comfortable, pleasurable reading even while making profound observations on a film. It is addressed to a wide readership across the book reading community, national and international. A scholar's book is research based and is meant primarily for other research workers the world over, as also for teachers who could selectively use the material in the book for appropriate use with students.. Most often students find a scholar's book high above them, and appropriately so. A teacher's book is shaped as a learning tool. It is not designed for smooth reading. In actual fact, it is dense writing and needs attentive, unhurried reading. Anything which needs emphasis is printed in bold type to draw attention to the importance of what is in bold type. Likewise, when the macrostructure of a film is being analysed the importance of the Part-Whole Relationship is re-emphasised by separating the description of the parts by inserting appropriate headings for the parts. Also, there are novel feaures in the indexes. There are no references to other books or journals because this teacher's book does not use any authority other than the three films. The only authority quoted once in this book is Satyajit Ray himself. Also, we made some assumptions about the reader when deciding the level of this book. This is a book on the Apu Trilogy and we assume that our reader has seen the films, and also has access to the films for crosschecking the detailed relationships presented in the book. This is a fair assumption about a serious student of cinema since discs of all the three films of the Trilogy with English subtitles are readily available in all major cities in India, also on the internet. For flow of scenes and English translation of dialogues, one could easily use the book Satyajit Ray: "The Apu Trilogy", English version based on the original films in Bengali by Shampa Banerji (2003. Seagull Books, 26, Circus Avenue, Kolkata 700-007. Edition: Second). In writing this text we sometimes use abbreviations for names of films, PP for Pather Panchali, APJT for Aparajito and As for Apur Sansar. Our concern with design in the film needs constant forward and back references. Hence a system for numbering of scenes in the film has been devised which needs patient handling, as in all referencing work. Thus APJT 32 Would Refer to Scene No. 32 In Index of Scenes In Appendix. The narrative in Satyajit Ray's films is usually simple and easily understood. However, his statements achieve deep levels through the complexity of audio-visual composition of cinematic images.